The Taylor County Sportsman’s Club has always believed in quality fisheries management. To achieve this, the Club has either assisted in funding projects, performed these projects, or done a combination of both. Some of the projects we have helped with are youth fishing events, fish stocking, fisheries habitat improvements, and assisting local lake associations with projects or with financial assistance to help them purchase equipment. If your Taylor County lake association or fish and game club is looking for project assistance, either call 715-748-4098 or send us an email at tcscmedford@gmail.com. Some of the projects we have assisted with are detailed below. All projects are done in cooperation with the WI DNR. Taylor County Sportsman’s Club annually releases hundreds of rainbow and brown trout in the Black River coinciding with the WI Fishing Opener in May. The trout are released from the millpond dam area down to the Perkins St. bridge in the city of Medford, Wisconsin. The trout program allows area fisherman, both youth and adults, a chance to fish the trout following the release. The tradition has become well know in the area and continues to build family values based on the outdoors. TCSC annually supports Rib Lake Fish & Game Association’s Taylor county fish stocking program. RLFG raise walleye fry to fingerling size walleye 6” to 8” in their local rearing ponds. Then, following the WI DNR management plans, these walleye fingerlings are then planted in all Taylor County lakes that the DNR has identified as lakes for stocking. 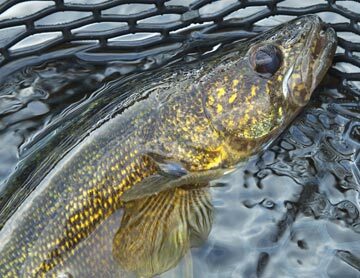 Their yearly goal is to raise sufficient walleye to stock all approved lakes. In 2014, that was roughly 7,500 walleye stocked. We are proud to help keep our local lakes fully stocked for fisherman. There are few lakes in Taylor County that do not have fish cribs courtesy of TCSC. Fish cribs provide predator protection, shade, places for food organisms to thrive and spawning grounds. This is a step in habitat improvement that we will continue to support when needed. Other habitat projects we have supported in the past include: lake shore clean-up, dam repairs, and projects to protect our local water resources. TCSC happily supports local programs that encourage new people to join the sport of fishing. We annually fund other local organizations like Westboro Fish & Game Youth Fishing, Spirit Lake Improvement, Rib Lake Fish and Game Association and Lake Esadore Fishing Clinic with their fishing clinics and contests. To view additional photos, go to our gallery.